In honor of Israelʻs birthday, we have a never before heard outtake from the “Wonderful World overture”. This song starts with an extended version of the instrumental intro from the first track on the album (What a Wonderful World) and transitions into the last song on the album “A Hawaiian Like Me”. Enjoy and Happy Birthday Israel. Happy Birthday IZ. Jon, you did a GREAT job. Keep up the GREAT works. P.S. Hope Brother Noland gets the award. Spiritual and stirring! Happy Birthday — your voice is a gift to all of us. IZ was a great talent. It’s sad that more people didn’t get to see him perform live. Everytime i here IZ sing he gives me goosebumps,my nephew gave me a cd with IZ songs on it. I love that cd for some reason when i find myself sad i listen to his music it does somthing to me that makes me forget my troubles..IZ will always be in my thoughts,my Heart and he is still in my Prayers.Thank you for your beautiful voice an amazing songs i will miss you IZ.Hopefuly One day I will get to visit the beautiful Hawaii.its my dream. I just heard the song “over the rain bow”, for the first time by IZ,,, HAS ONE MY HEART-FOREVER WILL BE PLAYING HIS MUSIC, SAD SOMEBODY SO TALENTED LEAVES US SO YOUNG-BUT HIS MUSIC WILL FORVER KEEP HIM WITH US….. The MP3 link is broken! What an Angel! 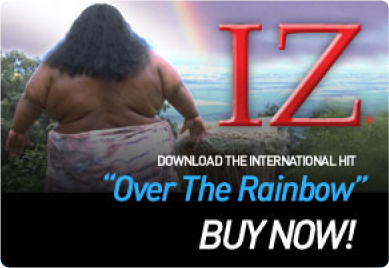 I listen to IZ’s “over the rainbow” to keep my head in a positive state of mind by visualizing my dreams to his song. I have one of IZ”s moments in time stamped in my brain, on the beach playing and singing “over the rainbow”. His beautiful music has inspired me to learn to play the uke. When in Hawaii one day I will come in search of his music and people who knew him. Thank you IZ. You are a legend! I wonder if anyone has considered starting a petition to rename Mt. Kilauea to Mt. Kamakawiwo’ole ? tickets in heaven before they sell out. WOW, what a blessing we were giving for from God. Awesome man he must of been.